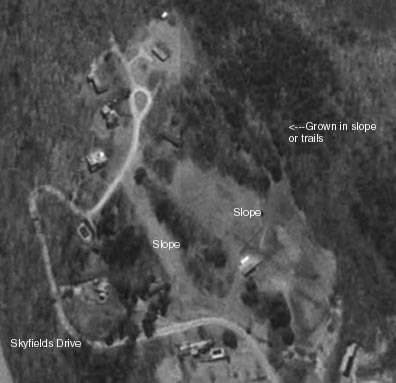 Skyfields is certainly a fascinating lost ski area. Open in Groton, MA sometime in the 60s or early 1970's, the area had at least two rope tows and perhaps four, according to a 1971 guidebook (from Betsy McDonough). It had skiing on 3-5 slopes and trails, along with a decent 150-200ft drop with great views of central MA mountains and southern NH. The area was operated by Phil Sweetser. I always had thought that the area was located directly on Rte 119 just east of Johnson's Dairy Bar. There was a rope tow line there and was close to the backside of Skyfields. That tow was NOT part of Skyfields, but rather a private tow that "appeared" one day in the mid 1970's. Skyfields is just east of town on Skyfields Drive and is very easy to spot. One of the coolest things about Skyfields was that the ski shop was a bus! Here's a picture sent by Robert Stefanik who received the photo from Darla Stefanik, and her sister, Karin Zaikis. This picture shows the ski shop, trails, and at least two tows (if you look closely) on the left and right sides of the slope. According to the family, the ski shop was run by the Bradley family, which still operate a gift shop in Westford, MA. 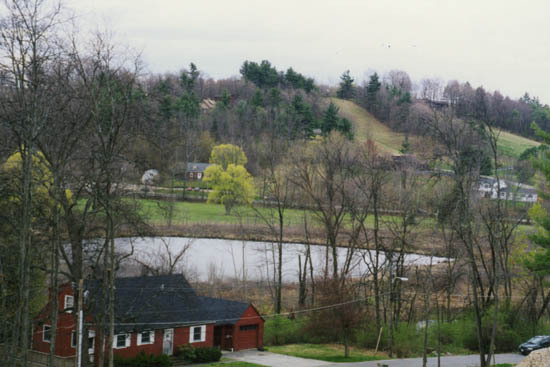 David Rodenhizer remembers this ski area: "Before I started school (<'68), the hill was already abandoned. Two of my best friends from 1st grade (on through high school) lived on Skyfields Drive in fairly new houses (nice contemporaries for the time) so perhaps the hill hadn't been closed for too long. If I remember correctly, there was still hardware on the trees of the slope (the big two visible from the "Lovers Lane" photo). 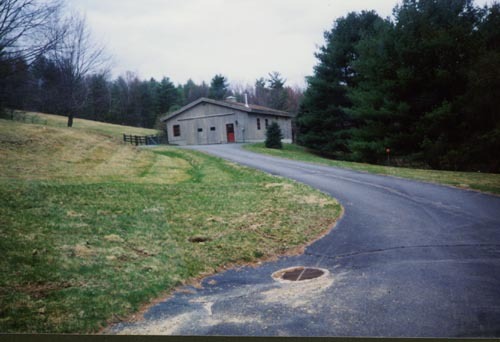 No base lodge, although the old farm/fruit stand at the base and/or the buildings behind it could have easily served that purpose, though with all the development in the past few decades, I doubt that they are still there." 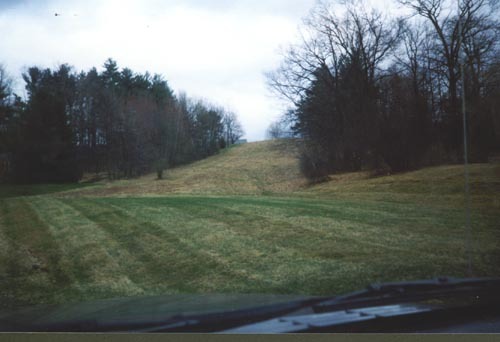 Looking up one of the abandoned slopes, taken in 1998 at the approximate location of the above bus, looking up to the upper left. A view of the base area, slopes on left. A view of the ski area from Lover's Lane in Groton. Thaks to Jed Diehl who took this photo! You can see what appears to be two slopes on the upper right of the photo. Do you remember this ski area? If so, let us know about it!